This is an absolutely gorgeous way to cook a really ordinary cut of meat. Brisket isn’t the most luxurious of beef cuts, it’s low on meat, high on fat, so it needs a slow cook method. 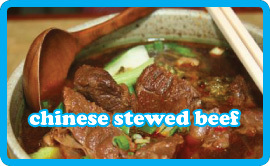 The Chinese perfect this with their hot-pot style dishes. Here’s a dish I made up using chinese ingredients. It’s really tasty. In a frying pan, heat the oil over a medium/high heat and fry the beef until browned on each side. Remove from the pan and set aside. Drain the oil into a large casserole pan and heat over a moderate heat. Add the onions and fry for 3-4 minutes until lightly browned. Add the garlic, ginger, star anise and 5 spice and fry for 1 minute. Add the sesame oil, soy sauce and beef and stir for a further minute. Add the beef stock and tomatoes and bring to the boil. Reduce the heat to low and pop on the lid. Simmer gently for 1 1/2 hours stirring occasionally until the meat is very tender. Remove the lid and simmer for a further 15 minutes, stir in the spring onions and simmer for a further 15 minutes until the sauce is thickened. Plain boiled rice alsongside steamed chinese greens.